While on a long hike to a monarch butterfly breading ground in the mountains of south central Mexico there was so much seen beyond the beautiful butterflies. From a profound Truth expressed by an eleven year old, to an experience of seeing everything (and realizing I’ve been trying way too hard), to really seeing how much we have in common with (and can learn from) monarchs. We arrived high up in the mountains and began our walk. The air was crisp and cold, the scenery was beautiful, and the silence of the woods was sprinkled with the delightful chirping and chattering of birds. As we walked up and into the thick mountain forest, our local guide shared with us that three weeks ago the monarchs had begun to head north on their migration to Canada and there weren’t many butterflies left. We continued on. As we hiked higher the wind blew through the trees in such a way that it sounded like waterfalls coming and going. The walk was wonderful, but even as we walked deeper in to the forest we didn’t see a single butterfly. My friend was apologetic. She felt bad that that we had missed seeing the masses of monarchs. Instantly, her eleven year old son shared so sweetly that it’s not about the destination, but the journey. I smiled. To me it seemed like the whole world smiled when my young sweet friend shared that Truth… from the mouths of babes. Yes! It was perfect. We continued on. We stopped to take a rest on a cliff-side perch overlooking treetops, a valley far below, and more mountains peaks in the distance. 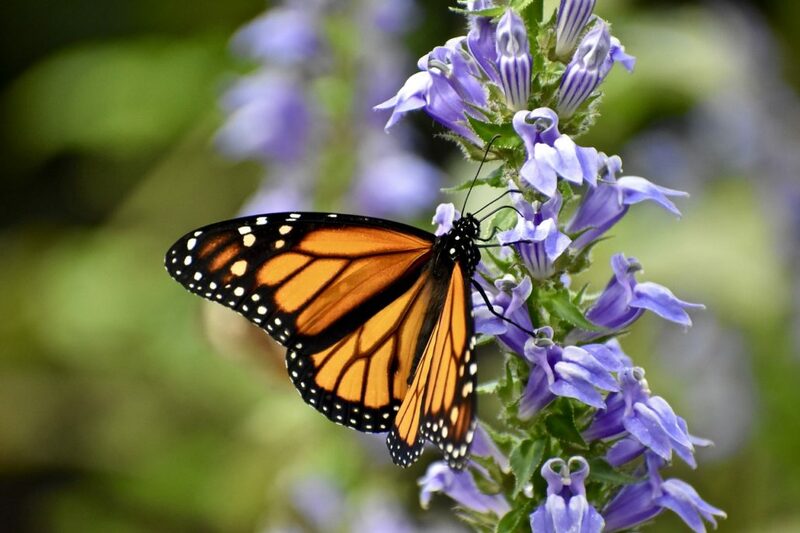 That’s when I looked up and saw occasional tiny silhouettes of fluttering butterflies against the blue sky: the stragglers and late bloomers of the monarch world. They were beautiful. Lying on my back on a massive rock outcropping surrounded by friends, looking up at the blue sky dotted with fluttering monarchs was bliss. “This is more than enough,” I thought as I enjoyed what I presumed to be the pinnacle of the day. After a long rest on the rock, we continued on. We walked to the top of the mountain and then followed our guide steeply down for a quite a ways. While slipping and sliding on narrow trails with grapefruit sized rocks rolling under our feet, I wondered where she was taking us. After a few miles we came to a flat area. Our guide asked us to stop talking and be as quiet as possible. The deeper we walked in to the thick forest, the more the forest came alive. In the gaps between the trees, the blue sky was full of life and the fluttering of tiny butterflies. We continued on. Soon there were branches of tall pines drooping low with the weight of hundreds of butterflies: unbelievable! There were monarchs almost everywhere I looked! Then it happened: I stopped to take in the silence and the bliss of this place. My vision softened and without realizing it, I was looking at nothing and saw everything. The instant I stopped focussing, the entire forest came alive. Everything came alive. In every fragment of my visual field were flutters… I could see thousands of butterflies all at once. It truly was pure butterfly bliss. After a few seconds, without realizing it, my vision closed in. It was almost as if I could hear my gaze tighten (imagine the sound in a sci-fi movie when a laser focuses). I was now focusing on one area of butterflies in the sky and all the others vanished. I was back to seeing as I normally saw. Each place I looked I could see the butterflies in that specific area, but no longer could I see everything. The forest no longer seemed alive. Hmmm…. Wow. What an interesting experience. I wanted to see all of it again. So, purposefully this time, I let my vision soften (like a blank stare). Wooosh! There it was again: My entire field of vision full and the entire forest abuzz with the flutters of life. Every inch of my visual field was alive with monarchs. I could see it all. The experience was utterly beautiful and mind-blowing. Like a kid with a new toy I stood in the forest looking and then not looking, looking and then not looking. Sure I could focus while looking at a specific area and see lots, but the instant I stopped focusing I saw everything. As I was amusing myself with this newfound view and enjoying the flutters of life all around me, I couldn’t help but see all of us in metaphor: What if we are all looking too intensely? What if we really are trying too hard? What if everything we are meant to see is beautifully abuzz all around us, but we are looking too hard to see it all? Could it All be Perfect? I don’t know what led me to soften my focus that first time, but something beyond me knew and it just happened. Even more astounding is: the star characters in my field of view were thousands of butterflies that had just undergone the most massive metamorphosis in all of nature. Each of those flutters in my field of vision had been tiny eggs that hatch into caterpillars. They wiggled around, munched on leaves and then turned to goop inside their chrysalises. Then the goop took form and emerged as beautiful monarchs: so light, playful, and full of life. Isn’t that perfect? What a perfect place to be. More and more, with each moment and each day, I am realizing that everything is always perfect. How can it not be? Then I see how those words could be interpreted indelicately. What if some people are in an utterly tough spot in life? How rude and uncaring is that for me to say that their pain and struggle is somehow perfect? Recently a friend read a message I wrote on this subject and got pretty upset. This is understandable: I’ve experienced seriously rough spots in life too and if someone walked up to me in the midst of those times and told me what I was going through was perfect… I too might have felt like slapping them. That’s just not a nice thing to say to someone in a seemingly tough spot. Then again, from where I am now, I can look back and say “Yes, it was all perfect, even the times when it certainly seemed horrible.” Now I can clearly see the toughest times ran their course and eventually led to today… and today seems pretty perfect. Lets consider the life of a caterpillar and this ‘perfect’ idea. The caterpillar might not have thought it was ‘perfect’ to turn in to goop inside of a dark chrysalis. In the midst of turning in to goop, flying to Canada from Mexico would have seemed extremely laughable. Surely becoming a butterfly was also a massive impossibility. Although, standing in the forest with the monarchs, it’s rather logical to see that turning into goop is actually quite perfect AND the caterpillar didn’t have to try: it just happened naturally. What if we can’t get life wrong? What if it is perfect, even when it seems everything is going wrong? What if all we have to do is stop trying so hard? Instead of looking so intently, what might be possible when we soften our gaze and take in everything that is already there? In those instances when we see everything, what if we then can see how perfect it all really is? Even more: What if we are all metaphorical goop… and life is our chrysalis? When I really considered the life that is possible for each of us individually, I realized one of the best ways to see this is together. There is so much more for each of us to see… so very much. The best part is: what’s available is right here already, we just haven’t seen it yet. The human mind is a beautiful instrument that begs to be played by all of us. When we understand how our mind works and how life works, everything gets simple and amazingly beautiful. We come alive, just like the butterflies emerging from their chrysalis. Let’s take a walk together. I’ve got two one on one client openings available beginning in mid April. It just might be the perfect time to bloom. Curious? Contact me by email or phone and let’s see if this is the next best step for you. https://yourevolution.com/wp-content/uploads/2019/03/monarch-butterfly-3643663_1280.jpg 853 1280 Kristy Halvorsen https://yourevolution.com/wp-content/uploads/2016/01/Logo-340-x-156.png Kristy Halvorsen2019-03-19 10:03:432019-04-20 11:06:41Are we trying too hard?